In its 620 page report Low Emissions Economy the Productivity Commission says that methane produced by the belching of sheep and cows – is unsuitable for inclusion in a single-cap ETS due to the difficulty such a scheme would have in driving emissions reductions in a manner that recognises the different atmospheric properties of short and long-lived gases. This is a slap in the face for James Shaw and all the other climate chumps who have been calling for enteric methane to be brought in to the ETS. 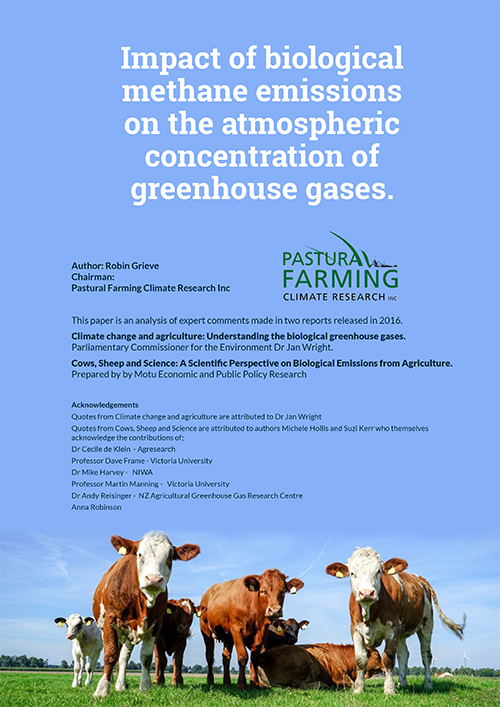 The design of our ‘all gases, all sectors ETS’ which included methane, and decade long calls for livestock methane emissions to be brought in to it by politicians and environmental groups have been based on ignorance and should now finally cease. The Government is faced with report after report which demonstrate how wrong the current treatment of methane emissions. The Government created an ‘all gases ETS’ which is not fit for purpose. This is not a little mistake and why the politicians got it so wrong and which climate scientists were advising them are questions that need answers. The Productivity Commissions report does not get it completely right about methane and demonstrates the scientists are themselves as muddled as anyone else when it comes to methane. When muddled scientists get together with ignorant politicians the result is a mess, and that is what we have now. Methane comes from the front end of a ruminant but Government policy resembles more closely what comes out the back. With methane emissions being of such importance to New Zealand whatever the Government does must be right. We cannot afford another methane mistake, and until such time as some scientific consensus is reached over what impact methane has in terms of global warming the politicians cannot even consider a political response. James Shaw has no option but to leave it out of his carbon zero bill.